As we witness the ongoing duel between Australia and South Africa, two of the greatest cricketers of our generation have come face to face perhaps for the last time, Jacques Kallis and Ricky Ponting. It should be no surprise though which of the two has chalked up scores of 147, 49 and an injury filled 58, and which has scored 0, 4 and 18. Equally its no surprise that which castled the other on the first morning, and his injury helped lead to absolute carnage later that day. Yes Pollock, Donald and (much later) Steyn were there, but the South Africa bowling attack was never quite up to the mark set by the Australians. Even if Ponting's batting flopped it could be easily disguised as McGrath, Warne and Lee ripped apart the opponents, and on the flip-side its much easier to come out and belt a century after these bowlers have reduced a team to a sub-200 score. What happened when the bowling attack all retired in one big bang? Ponting's numbers fell dramatically while Kallis's numbers were always consistent. Wouldn't it be nice to walk out after Hayden and Langer have softened up the opening attack? And that too surrounded by the likes of Martyn, the Waughs, Symonds, Hussey and of course Gilchrist. Kallis had buddies in the form of Smith and much later de Villiers and Amla, but for the majority of his career he has had to fight a lone hand and single-handedly prop up the batting efforts. On top of that, he has a superior batting average and that too having to face the mighty Aussie attack. 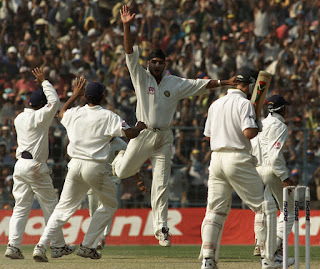 Nearly 300 test and ODI wickets of bustling fast-medium bowling. He could nearly make the South African team on bowling alone with an average consistently in the low 30s, this is an extra burden that Ponting has never had to deal with. A batting average in India of 26 and a place in history as Bhajji's only bunny. Enough said. Just take a peek to any Kallis Youtube video and the abomination known as the Youtube Comments Section. The scum of the earth reside here, and you will see endless tirades about how Kallis is flabby, unfit, lazy and above all boring. This is a guy that can bat all day, take very good slip catches and then charge in and bowl at over 130km/h. Injuries have hardly been an issue in a career that started in 1996, good luck finding anyone fitter than that (aside from the machine known as Courtney Walsh). Ah yes, the bane of every South African cricketer including Kallis. Imagine if the Saffa's scampered home to victory, that would be 13 years of emotional hurt, constant sledging and World Cup choking vanished! Just look at what Shaun Pollock had to deal with. Kallis is the best all-rounder of our generation and at least top five in the history of the game, he is a player who gets far too little respect. The 'Player of the 2000s' Ponting has usually been riding the wave of an amazing team around him and never had to deal with the added psychological pressure. Both are very good world class players, however there is no question which of the two is superior.